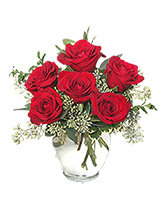 Red roses is an elegant way to say, "I love you." 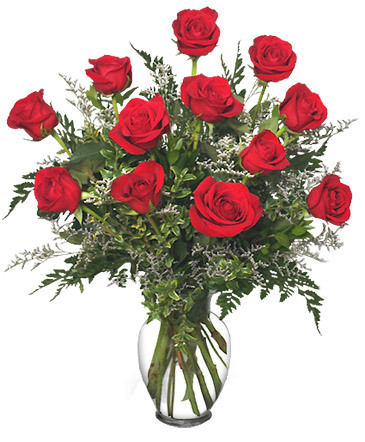 ***These are available in Standard($74.97) and Premium($84.97) Versions..Premium being larger buds,longer stems,+ Extra's, both will be in a RED COLORED VASE FOR VALENTINES (WHILE THEY LAST). 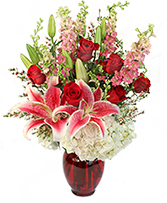 **NOTE**Call order in for everyday pricing as our website Valentine Pricing is in effect for early ordering convenience. 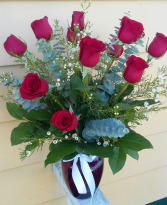 Half Dz Red Roses Modern Design with greens **Also available with With Filler flowers...$42.97.